We’re renegades, I recently told a friend, making art that blurs defined lines. We combine visual art with word art. We seek to give art air, offering paintings and poems to people and places in unexpected ways. Such a blending is not an especially unusual idea but still I sometimes feel out of step with writers and artists taking more traditional routes. We’re traveling a pebbled path, I tell my friend, but we’re not alone on the trail. 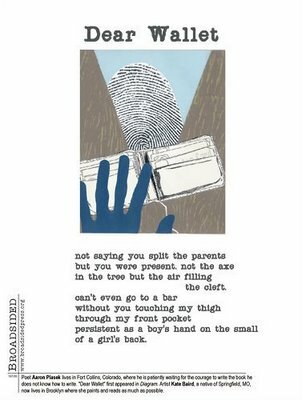 Every month, BroadsidedPress.org publishes a new literary/visual collaboration available as a single-sheet PDF to print, enjoy and share — for free. "Vectors" then print the sheets, called broadsides, and post them in public places, such as cafes, hallways, and bathroom stalls. Vectors are situated across the globe. I’m a vector! And you can be a vector, too. In fact, a few states are woefully vector-less. Alabama, Delaware, Hawaii, Idaho, North Dakota, New Mexico, Rhode Island and Wyoming need volunteers to spread the joy of words and art combined. Consider this a call to action, to artists, to writers, to creatives of all sorts: Take to the streets. Share art and thrive!